WIN is the only charitable, not for profit organization in Westlock that provides services for our community members with various disabilities. What Does it Mean to Be a Non Profit Agency? The purpose of a business is typically to turn a profit. In the case of a non profit agency, the purpose of the business is not to make a profit, rather it’s purpose is to benefit the public or the persons that business serves. The purpose of the non profit agency is it’s mission. Many people think that a not for profit agency must not make a profit, but that is not actually the case. Any business, non profit or for profit requires revenue to cover expenses. A non profit agency may have a surplus of revenue after expenses are paid (profit). A key difference between the non profit and for profit organization is in how the profits, if any, are distributed. In a not for profit agency, the profits must go back into the agency, whereas in a for profit organization, the profits are distributed in any manner the business owner chooses. A for profit business or corporation is owned by an individual or individuals such as shareholders, investors and partners. In a non profit agency, there are no owners. With regard to WIN, the agency is governed by a board of directors comprised of community members. There is no owner. WIN exists solely for the benefit of the people it serves, and for the benefit of the Westlock community by extension. To enhance the quality of life for people with disabilities through innovative personalized services. The revenue received by WIN, and any profits realized go directly back to enhancing the quality of life for the individuals we serve. There is a famous quote by Ghandi speaking about measuring the greatness of a nation by the way it treats its weakest members. It can also be said that the quality of life in a community can be measured by the way that community treats its most vulnerable members. Therefore the mission of WIN, to enhance the quality of life for people with disabilities, by extension, increases the quality of life, or greatness, of our community. The chart below illustrates the funding sources for the year 2012-2013. 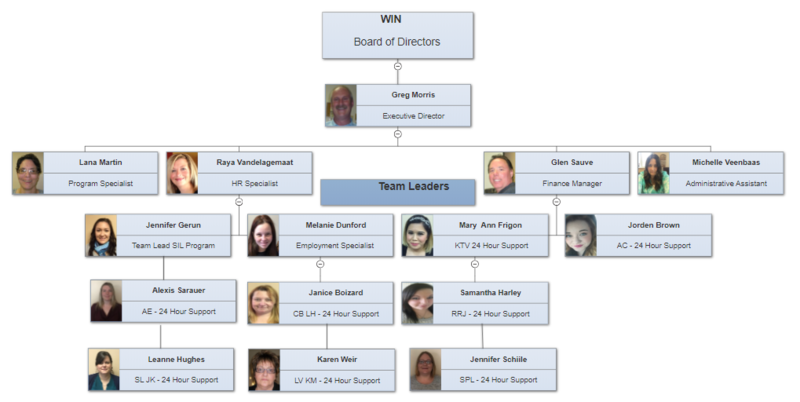 WIN is lead by a volunteer Board of Directors. WIN uses Person Centered Planning and Thinking – click here to learn more!